1. Madison County Bridge Tours—Provided by the Winterset Rotary Club, departing every 20 minutes. Tickets purchased at the red Rotary booth on S. 1st Street at the Holliwell festival entrance. Tours last approximately 90 minutes. $10 per person donation. 2. Firefighters’ Pancake Breakfast at the Winterset fire station, 124 W. Court Ave. A great way to start your day! 6:00-11:00 am. 3. 4K & 8K Runs—Saturday, 7:45 to 8:45 am: Registration check-in at Winterset City Park. 8:45 am: Individual Children’s Race begins, followed by 4K/8K Run/Walk at 9:00 am. Winterset City Park. 4. Sheep shearing and wool spinning by the Madison County Sheep Producers. 5. Meet Me at the Bridge at the North Shelter at City Park, Saturday at 6:00 pm. Music by Crosswind; dinner for $10.00 per person. 6. Covered Bridge Quilters Annual Quilt Show. 9am to 5pm on Saturday and 10am to 4pm on Sunday at the Winterset Elementary School. $3.00 admission. 7. Cowboys of Wild West Creations. This 1880s cowboy troupe will be roaming the streets of Winterset again, posing for photos and having shootouts around the square. 8. Old-Fashioned Spelling Bee, located on the courthouse steps. Watch Madison County students compete at 11:00 am and 1:00 pm. 9. The 31st Annual Madison County Car Show, held in the field behind the Winterset School District Administration building. Sunday only. Registration is from 8am to noon, with awards at 3:30 pm. 10. Parade— One of the best-loved events of the Madison County Covered Bridge Festival! It begins at the high school at 2:00 pm on Sunday and heads north on 8th Avenue until turning east on Court and continuing to the other side of town (on Court and Washington ). 1. 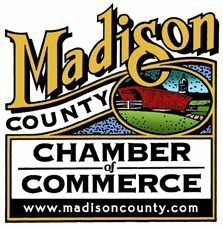 Create a Covered Bridge by Morry Hay and Tom Clause, hosted by the Madison County Chamber. Help create a replica of the Cedar Bridge. 2. Glass blowing demonstration by Robin Paul of Madhaus Gallery. 3. Chain Saw Carving by Andy Klindt. 4. The Abridged History of Quilting with Marianne Fons. Located in front of the Iowa Quilt Museum on Saturday at 11 am, 1 pm & 3 pm. 5. DIY – Barn Quilt Block Painting Demonstration by Mark Davis in front of the Iowa Quilt Museum, Sunday at 10 am and 1 pm. 6. “Patchwork Heirlooms: Care and Storage of Quilts” Hosted by Virginia Berger in front of the Iowa Quilt Museum on Saturday at 10 am, 12 pm, 2 pm, & 4 pm. Learn about quilt patterns and dating. 7. Tethered hot air balloon rides. Conducted by Boden Balloons in the field behind the Winterset School District Administration building. $20 per person. Saturday only. 8. Airplane rides over Madison County. Up to three guests can go up in an aircraft and fly over the festival grounds and Hogback Covered Bridge. $20 per person. Located at the Winterset Municipal Airport. 9. Bonfire and s’mores, cannon firing and Civil War skirmish at the Madison County Historical Complex. Saturday, October 8th, starting at 6:45 pm. 10. Canoe and kayak rentals at Cedar Lake through Middle River Rentals, Saturday, 11 am to 3 pm. For more information and a complete schedule, see the Covered Bridge Festival page.